Bien hecho. Glad for the opportunity to share your gem. I have a Don Larson autograph. Wish I had yours. Cogratulations!!! You made all Giants Fans Very Proud far and near. I moved out of the country but I wil always bre a Giants Fan. What a game. I was in the Bay Area for a week of training and kept contemplating whether or not to go to a game! Glad I held my decision off for a last minute one… Bought my ticket on line the same morning, jumped on BART in Dublin and headed to witness HISTORY! Great job Matt! You were amazing that night and everyone I’m in the bay I look to see if there’s a game and if you’re pitching. Good luck the rest of September and lets bring the WS back to San Franciso!! I want to congratulate you on that awesome perfect game.Actually,two days before that,June 11th,I had just graduated from high school and heard you throw that perfecto.I want to congratulate you again and thank you for (kind of) giving me a graduation gift! That was one heck of a game. Yet, even with impossible odd’s my boss gave me a pair of those June 13 tickets in sec 124. I took one of my best buds who is also a Giants fanatic and received something better than a good game on wednesday night. You gave us memory and an experience that will last to our dying days. A memory that sends chill down my spine just thinking about it. Thanks again and I hope to meet you and the rest of the crew someday so I can tell you this in person. P.S. as a former outfielder I have dreamed of making game saving catches like Blanco did for you. That was Unbeliable as I’m sure you know. I ment unbelievable* and bud* but who’s judging right? My wife and I have been married 11 years and for most of that time, we had been trying to create our family. It’s funny because when I was younger I spent a lot of time trying *not* to get anyone pregnant but then when you really want it to happen and it doesn’t, it can be the most emotionally challenging time in a couple’s married life. Now think of living that challenge every day for nearly 10 years. Not too fun. Then something wonderful happened- on June 3rd, 2012 a baby girl was born to a young woman who had selected me and my wife to be her newborn’s adoptive parents. We were in the delivery room to see this miracle unfold and I have to say it was one of the most thrilling moments of my life- I was the first to officially hold the baby (who we named Brooklyn) and I was overcome with joy and love. An amazing moment. Me, my wife, and 10 day old soon-to-be-adopted baby hung on every pitch. The excitement and drama was so thick- thicker even than that of the 2010 World Series that I followed like a rabid bloodhound. When Arias fielded that grounder and made that tough throw for the final out, we all shouted with happiness and relief at your singular accomplishment. It was Brooklyn’s first ever Giants game and, as such, I will never forget it. When she’s old enough and is a die-hard Giants fan like her daddy, I will tell her the story of her first baseball game- when Matt Cain pitched a perfect game. Congratulations and thank you for a very special, life-long memory for me and my growing family. A night any Giant could never forget — I remember I got home and checked the box score when it was about the sixth inning. Then, as I usually do when I’m reading the stats, I check to see if the pitcher has given up any hits. The box read ‘0’ and as I scrolled down with my heart pumping by the second, I just see the K’s tally up without a single BB to give for the ratio. I wanted to turn on the television but I wasn’t sure if that would jinx the moment, but then the ninth inning came up so… to miss history in the making would have been just plain stupid. Great job on your perfect game! You are one of my favorite pitchers. Please say hello to Buster and Tim for me. I am hoping to go to San Francisco next season to see you play. I would love an autograph of you. My little brother likes you too. Congratulaions to Matt Cain you are the best pitcher in NL history, The perfect game was meant for you Matt and all the San Francisco Giants fans Thank you for sharing that special day with all of us, we love you.. Veronica Carreon, PSL, Fl. 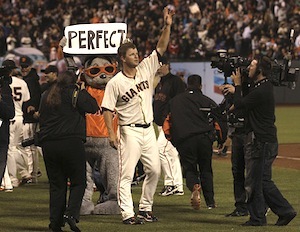 Matt, it was awesome to watch you throw a perfect game. We love you and you look alot like my son. Congradulations again. Your daughter and your wife are beautiful too. keep up the good work. YOU ROCK! Well, just like the WS from “how many years ago now?”, the Giants’ PR dept ought to be able to milk this game for a couple years. Their shameless commercialization of a brilliant performance seems to tarnish the memory. Congratulations Matt! What a pleasure it was to watch your masterpeace unfold!